Trade secrets and post-contractual non-compete clauses (restrictive covenants) are intrinsically linked issues when analysed in the context of past and present employment. While trade secrets have been the object of legislation in a number of major jurisdictions during the last couple of years, post-employment restrictive covenants have been left out of such legislative activity. Still, they have come under increasing scrutiny of economists and may well come into legislative focus in the near future. 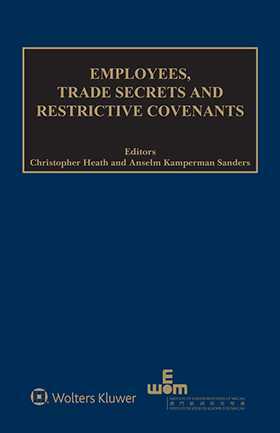 As the chapters of this book highlight in detail, the approach to the protection of trade secrets, the conditions under which an employer can protect trade secrets and other business interests by way of a restrictive covenant, and the scope within which former employees by using the skills and knowledge can compete with a former employer, hugely differ from jurisdiction to jurisdiction. This is not only so for the effective scope, but also for the underlying doctrinal reasons, making a country-by-country comparison difficult, and a common structure of the chapters a challenge. After all, the topic involves international law (Paris Convention, TRIPS), domestic labour law, domestic sui generis protection, and, most importantly, domestic competition and unfair competition law, a field that up to now has defied all attempts of harmonisation beyond those categories as identified by Friedrich Zoll and implemented as Art. 10bis in the Paris Convention. This book features both comparative and country-specific chapters. The latter cover the major jurisdictions of Europe and Asia, while the former provide a subject-matter analysis by taking into account legislation and case law in a global context. “Pacta sunt servanda” – sed quousque?